How to Update the software version on your realme Smartphone? Learn how to update your realme phone to the latest software version. Should you update the software version? Almost every smartphone receives notifications of system updates. You may wonder whether you should update your device. 1. Optimizing the system performance. 2. Prolonging your battery life. 3. Developing compatibility with more third-party apps. 4. Enhancing the system stability. 1. Plug your realme phone into power, or keep the battery level over 40%. 2. The update process takes some time. Do not operate or power off your device during the process. 3. DO NOT root the phone yourself, for that might cause damage to your system, and the warranty service will be terminated immediately. Update your realme phone wirelessly. 1. Connect to a working Wi-Fi or Mobile network. The system will automatically show new update, if any. You can see a notification on the "System updates" icon, otherwise it will show "It is already the latest version". 2. Download the firmware. Download under a Wi-Fi network to avoid the consumption of your mobile data. 3. Click [System Updates]. Your device will reboot and start updating, which will take a few minutes. Update with SD Card (Recovery Update). Update with SD card is mainly used if the phone freezes at a certain interface or realme logo, or can't boot but can get into Recovery Mode. 1. Go to realme Official website > click Support > Software Updates , download the firmware to the root directory of your SD Card (A root directory is the top-most directory in SD Card file systems) . 2. Insert your SD card, then power off the phone. 3. Press and hold the Power and Volume Down buttons, until your phone enters Recovery Mode. 4. Under the Recovery Mode, click [Install from storage device] > [Install from SD] , find the update package. 5. Click the firmware. A confirmation message will appear on your screen. Click Yes. Your device will reboot and start updating, which will take some time. 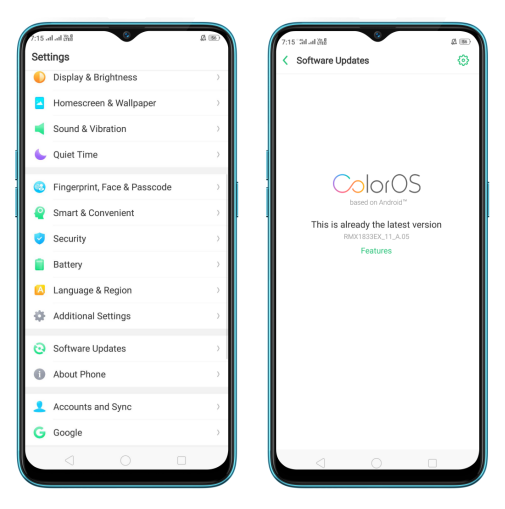 For ColorOS 5.2 and above, Online update (keep data) in Recovery Mode is to download the firmware of latest system, which is the same as go to website to download a firmware. Before that please be sure that Wifi is connected and sufficient battery power. 1. Press and hold the Power and Volume Down buttons, until your phone enters Recovery Mode. 2. 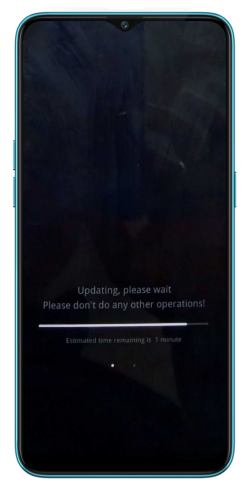 Under the Recovery Mode, click [Online update (keep data)], connect Wifi and please do not perform other operations in the process until successful update. Update with the assistance of local realme Service Center. If you can’t update by yourself, please backup the important data, bring your mobile phone, invoice and warranty card and go to the local realme customer service center to ask professional maintenance engineer for help. To find the nearest service center, you can go to Realme official website > Support > Service Center. How to make new ColorOS updates in your realme Smart device?